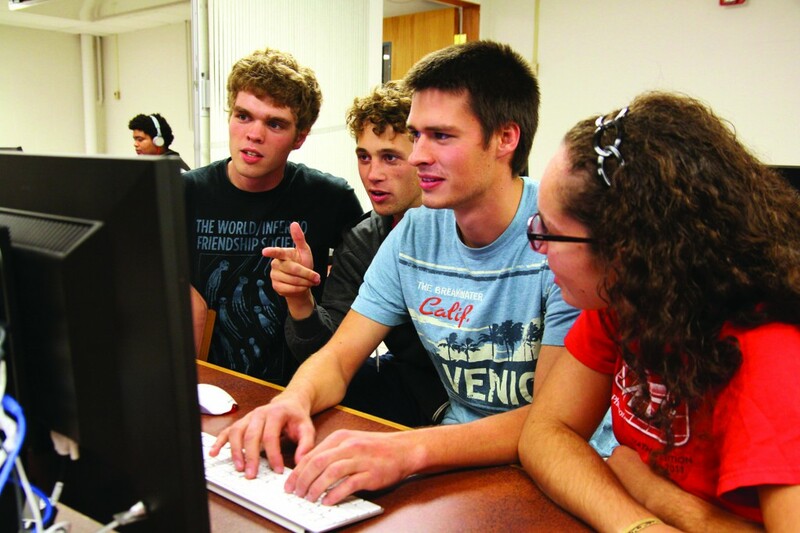 A team of four programming students participated in a programming competition sponsored bythe Consortium for Computing Sciences in Colleges at University of Findlay in Findlay, Ohio last Tuesday. The competition focused on promoting quality computer-oriented curricula as well as encouraging effective use of computing in small higher learning institutes. The CCSC has 10 destinations across the nation. The Midwest region of CCSC welcomed Goshen College for the first time to participate in the regional event. It all started in a class setting, when Kent Palmer, informatics professor, asked students to participate in a regional programming competition. Four students did. Without competitive experience, juniors Jacob Shetler, Maria Jantz, Michael Yoder and Seth Yoder faced timed computing challenges. A total of 70 competing programmers from around the region divided into 24 teams to compete. Six programming tasks were given to the students to be completed in one morning. The GC team completed two of the six tasks. “This makes the team exceptional in the general context of the competition,” said Professor Palmer. “The practice session was much harder than the real competition,” said Seth Yoder. If informatics students start to familiarize themselves with these kinds of competition as early as freshman year, Michael Yoder believes, it will be a good addition to boost the level of programming here at Goshen College. “Now we are familiar with the format. Next time it will definitely be good for us,” said Yoder. Professor Palmer said he has already drafted a plan to expand the field of competition for programming students. “Next year, I actually hope some of the students not only do the programming completion but also do a poster competition where students compete based on research material they submit,” said Palmer.